Last week we began examining the wind farms scattered across Pennsylvania’s ideal windy landscape. Let’s take a look at eight more wind generation facilities that are part of the state’s 24 wind farms. The Locust Ridge I wind farm became operational in 2007. The site is located near Mahanoy City in Schuylkill County and has the capacity to generate 26 megawatts (MW) of clean, renewable wind energy. The wind farm spans across 1,038 acres, but only 13 wind turbines are spinning above the land. In fact, the turbines only take up about 3 percent of the space on the ground but stretch 256 feet in the air. Locust Ridge II, which started generating wind power in 2009, is located right next to Locust Ridge I in Shenandoah, Pennsylvania. The site straddles Schuylkill and Columbia counties and spans across 5,700 acres of Pennsylvania soil. Locust Ridge II is capable of generating 102 MW of wind energy with its 51 turbines at 256 feet high. 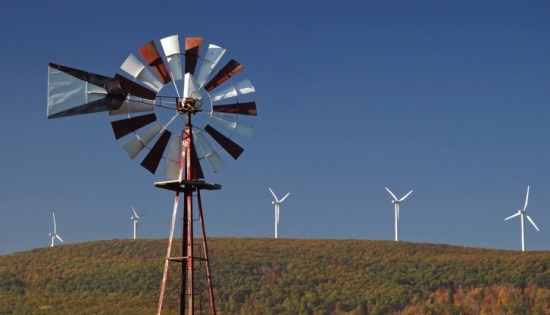 Both Locust Ridge projects generate enough wind energy to power about 38,000 homes. Somerset County is bursting with wind turbines. The Casselman wind farm, built in 2007, is just one of many located in the area. The Casselman site not only produces power, it sits on top of an old coal mining site, putting the once energy-rich land to use again. With 23 wind turbines the wind farm can generate 34.5 MW of renewable energy. First Energy signed a 23-year power purchase agreement for all of the renewable energy generated at Casselman – enough to power 10,000 homes. If you happen to pass through Summerset County, you won’t miss these turbines. They are 389 feet tall – about the height of a 30-story building. With only 14 turbines, you might think the Forward Wind Power Project produces very little energy. But regardless of its small number of turbines the site still generates 29.4 MW of clean energy. The site, which became operational in 2008, is located in Hooversville, adding the Forward wind farm to the list of farms located in Somerset County. The Lookout Wind Project is situated in the Brothersvalley and Northampton townships, also in Somerset County. The wind farm, which opened in 2008, has a total of 18 turbines that generate 2.1 MW of energy each. When all of its turbines are spinning in optimal wind conditions – typically over 20 miles per hour – the Lookout Wind Project can generate 37.8 MW of renewable power. Drive through Cambria County and you’ll see the Highland Wind Farm, which sits on top of a reclaimed strip mine. Though the construction on the wind farm began in 2005, it didn’t become operational until 2009. Now the site’s 25 turbines are spinning furiously. At maximum capacity, these turbines can generate 62.5 MW of power – enough to power 15,000 homes annually. The renewable energy generated at Highland is connected to the Penelec grid and is sold to First Energy, which in turn delivers the clean power to its customers. The North Allegheny Windpower Project is comprised of 35 wind turbines that have the capacity to generate 2.5 MW of power each. At its maximum capacity, the facility can produce 70 MW of renewable energy, enough to supply about 18,000 homes. The wind farm, which can be found in Blair and Cambria counties, began generating wind energy in 2009. The Stony Creek Wind Farm is yet another example of how Pennsylvania is reusing its energy-drained land. This facility, like many others, sits on top of a reclaimed surface mine. Sony Creek became operational in 2009 with 35 wind turbines, generating 1.5 MW each. Collectively, these turbines can produce about 52.5 MW of renewable wind energy, which is purchased by the Southern Maryland Electric Cooperative.